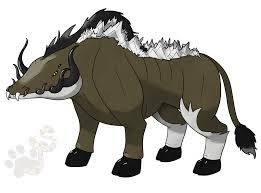 A common creature that lives in the plains and forest of Gricidea. They are not very strong, but being careless around them can prove fatal. Weakness: Fire (x2), Ice (x2), Elec (x2), Pierce (x2). Tackle: The Warhog rushes its opponent without stopping. +5 DMG. Two forms of wolves attuned to specific areas of the Gricidea climate. Though they differ in color and mindset, they are equally as dangerous no matter what. Ability: Moon's Aura-At night, this creature emits an aura that reduces physical and magic damage on itself by 5 points. 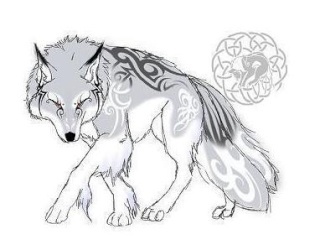 A humanoid teen that can take the form of a large wolf. 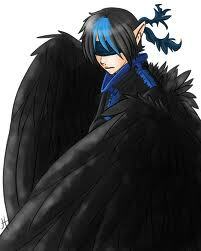 He usually roams with the Nightguard and will not hesitate to call for his help if he is in danger. Free spirited, the pup usually gets himself into trouble though he doesn't always mean to cause harm. 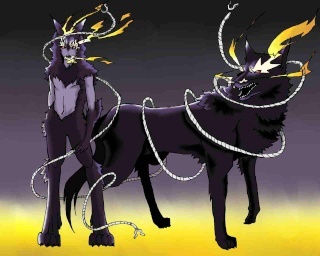 Said to be the guards of the demon Cerberus, the Nightguards are Cerberus Pup's that have undergone a permanent transformation. They retain their memories of being Pup's, however, they lose much of their personalities in the process. Though seeming cold to everyone except their counterparts, Nightguards are extremely loyal to those they trust. Flying bird-women with wings as arms and razor sharp talons. 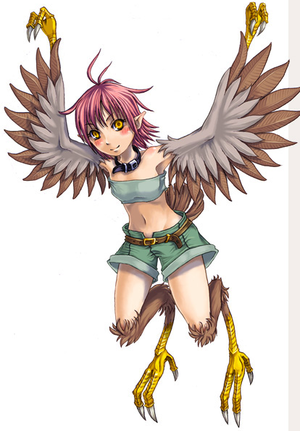 They are even more calm than their normal Harpy counterparts. Most tend to avoid conflict where it is unneeded but will not let a bad deed go unpunished or a good deed unrewarded. Unfortunately, the Harpraven's dark powers are highly unstable and they sometimes lose control, going into a blind rage and attacking anyone and everyone nearby. This predominantly happens when they are in heat. Because of this, they tend to travel alone and rarely show up in crowded places. 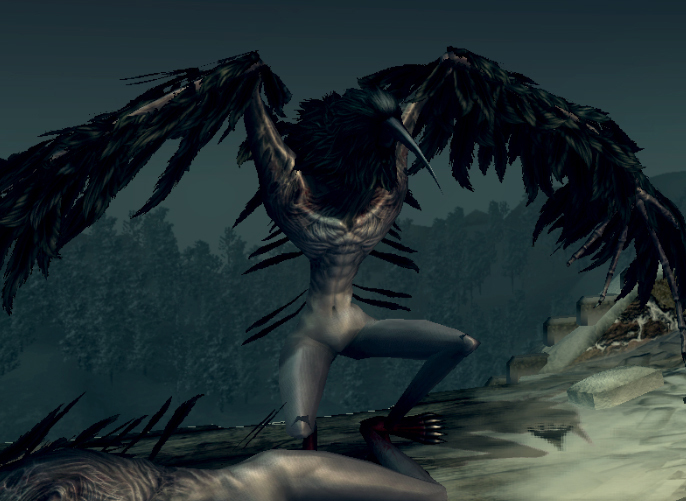 Flying bird-men with wings as arms and razor sharp talons. They leave their eyes covered as a form of natural training and their senses are at their peaks. Just as the Harpraven, Tengu tend to keep to themselves. However, they have very adept control of their dark natures. 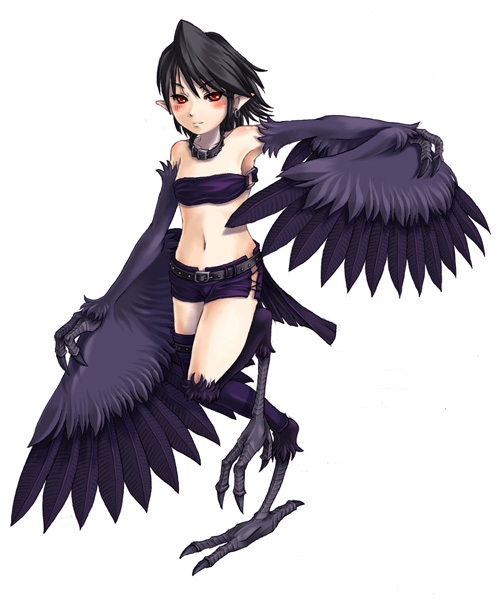 A man-sized crow, with blood-red eyes, and jet-black wings. They usually stalk the first few areas at night, usually roaming as a duo, or a pack of three. They are very hostile when encountered and their strength proves they are no pushovers. A clay golem animated with magic. It picked up sedimentary as it traveled and learned to speak through travelers. They are often mistreated due to their rocky looks and bad tempers. Some golem will obey a master who can prove their strength over them. The embodiment of the flames of war in its weakest state. Though in the form of a teenage boy, the power within this monster is extraordinary. Many woman take them as lovers, but often times they are used as slaves. 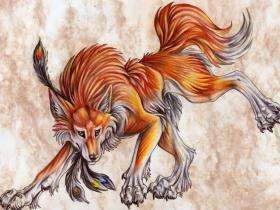 Their passive nature makes them seem docile, but they are very aware of everything that goes on around them. Ability- Flame Body: When being attacked physically, 40% chance to burn the foe. A young woman that was cursed for her beauty. A wicked water witch placed a spell on her and her lineage to forever have the bodies of liquid monsters. Though with no actual organs, the Slime Princess can still reproduce sexually. Ability-Multiply: When struck with a slashing weapon or ability, the Slime Princess will make a single copy of itself with half of its maximum stats. The copy does not drop items but gives 25 exp upon defeat. If the main Slime Princess is killed before the clones, the clones fade away and no exp is gained from them. Aria of Water: Prays to the spirit of water in hopes to heal itself by 20 points. Effect active in next post unless defeated. A Slime Princess that has allowed her negative emotions to taint her pure water. These Slime Princess are dangerous and enjoy causing pain. However, they are not above saving. Though their bodies have become tainted, they will not poison those they have come to trust and respect. A Poison Slime Princess that falls in love will transform into a Slime Queen as well. Ability-Multiply: When struck with a slashing weapon or ability, the Poison Slime Princess will make a single copy of itself with half of its maximum stats. The copy does not drop items but gives 25 exp upon defeat. If the main Poison Slime Princess is killed before the clones, the clones fade away and no exp is gained from them. Aria of Poison: Prays to the spirit of poison in hopes that the foe's that strike it with either physical or magic attacks will be poisoned. If they are attacked twice, the foe will be stricken with toxin. Effect active for 3 post. Poison/Toxin remains even after monster is defeated. Once a Slime Princess has partially broken the spell of the water witch, she will become a Slime Queen. Seeming as three people in one, the Slime Queen is every bit as resourceful and intelligent as her human and beastkin counterparts. She is able to shapeshift into triplets with normal human or beastkin bodies occasionally, but needs extended rest if she does so. No one knows what is the last key to breaking the curse for the Slime Queen. Rebirth of Water: Has 25% chance to be resurrected upon death, however, all stats are halved as a result. Health fully recovers. Arm sized wasp with steel stingers. They aren't very powerful, but they never attack alone. Being swarmed by these creatures has caused many a deaths. 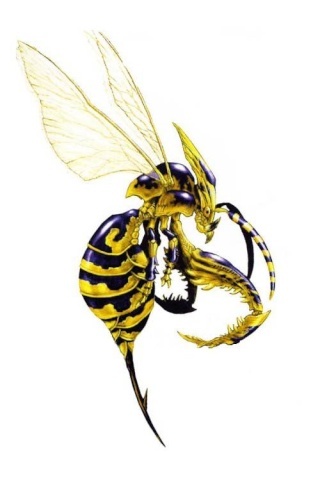 Ability: Swarm- When using the same attack as a partner consecutively, deals +5 damage. 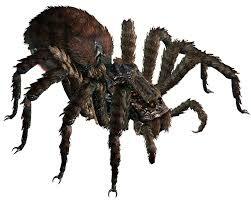 Large arachnid creatures that prefer dark places. Usually only coming out at night to hunt, if you venture underground, you will be in their territory. Ability: Territorial (Spider)-When within an area marked as a spider's domain, gains and additional +5 to all stats except health. A small machine in the form of a spider. 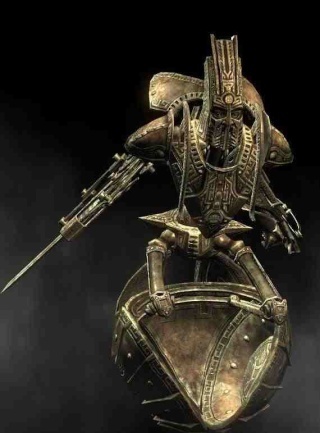 They run off of magical electricity and tend to stay around the mechromancer. There is thought to be a queen somehow producing these creatures. 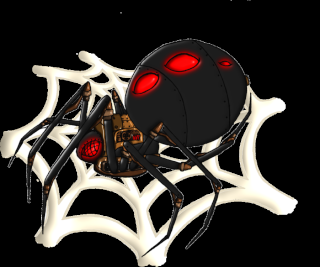 Ability: Detonate-When defeated, the Mech Spider will explode in a 5 meter radius, dealing 20 points of damage, disregarding defense, weakness, and resistance. A machine crafted by ancient technology. It functions through leftover magic from its time. The sphere it sits on is a congregation of the magic it has absorbed. Over Clock: The AGR ramps all of its abilities to the max, healing itself by 5 points per post until it is defeated. Gives immunity to paralysis. A living puppet made of wood, but with the inner workings of a machine. They are the size of a pre-teen child, and just as mischievous. They somehow have the power to control lesser machines. 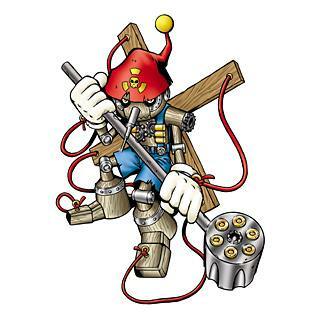 Mech Revive: The Mechromancer and revive any weak broken machines and make it his ally. A common creature that wanderers happily through woodland areas. They look like small children, but should not be taken lightly. They become agitated when they get lost, which is very often. Those who work alongside humans and beastkin are very polite. Ability: Nature's Blessing-The Sapling has a natural regen effect of 5 HP per post. Ailment's only lasts 2 posts on Sapling. Leech Bullet Seed: Fires a rapid blast of rock hard seeds at the foe that sprout energy sapping flowers. Gaia Magic/ DMG+8. 4 points of damage per post. Heals user 4 HP per post. Docile women creatures that are extremely shy. They are the older form of Saplings, and many can be seen living in establishments with human and beastkin, usually as lovers. However, in the wild, Mandragora, though shy, are easily frightened and sometimes attack due to misconceptions or just because you came a little too close...by 15 feet. 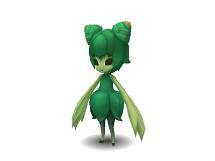 The more aggressive Mandragora will even attempt to mate with a male human or beastkin simply to make more Sapling. Ability: Nature's Utmost Blessing- Mandragora and all of her allies have a natural regen effect of 5 HP per posts (stacks with other regen effects). Ailments only lasts up to 2 posts on Mandragora and her allies. Healing magic used on or by a Mandragora has its effect doubled. Plant men whom have sworn to protect the forest and its inhabitants. 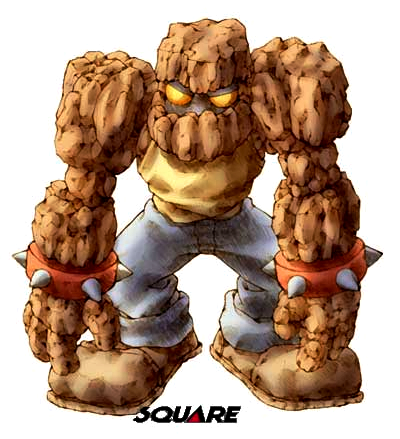 They are extremely fond of the Mandragora and Sapling race, and become very hostile if they are attacked without just cause. 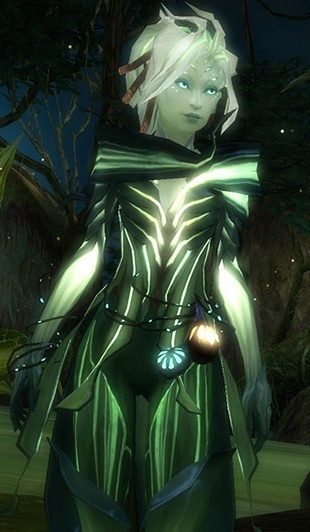 However, showing their intelligence, they will not help a Sapling or Mandragora whom has provoked attack on their own. Many Mandragora Knights lead normal lives within the cities of LEO, some even being in positions of power such as councilman and mayors. Feral bi-pedal lizard armed with various weaponry. They usually come in groups of four and can be deadly if handled improperly. Ability: Hunting Party- As long as this creature remains within sight of it's allies, and it is not being targeted, it has a +25% sneak attack bonus. Feral bi-pedal lizard armed with bows and arrows. 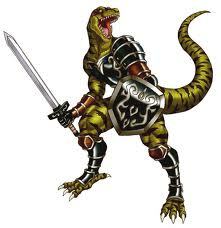 They keep their distance, letting the Lizardman and Raptor Knights do the close hand combat. 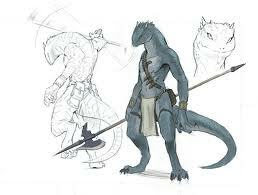 Feral bi-pedal lizard whom have learned to wield arcane abilities. 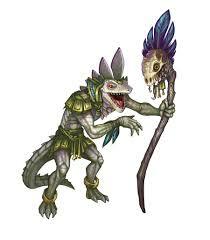 They are adept with water and ice magic as well as saboteur spells, synergy spells, and healing spells. Feral bi-pedal lizard whom have trained to become powerful warriors. In their kingdom, they are knights and have the skills to prove their status. 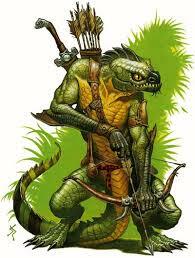 Ability: Leader of the Hunt- As long as this creature lives, itself and all of it's allies gain an additional 15% to all critical rolls.